Instantly resurface, smooth and brighten your skin with this daily, LEAVE-ON exfoliating treatment. Each self-contained dosage contains AHA and BHA acids and enzymes to smooth the skin helping to reduce the signs of aging without being irritating. Also contains Japanese Unshiu Citrus and rice extract to even skin tone and Rooibosand green teas to soothe skin and add moisture. 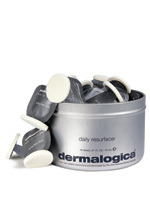 A great new easy-to-use product from Dermalogica.